I would like to thank Crystal Lake Publishing for the Advanced Reader’s Copy! Before I get started I want to share a little history about this collection. Whispered Echoes was originally published by Cemetery Dance Publications. Previously available only in a deluxe limited edition, Whispered Echoes features the resurrection of eleven classic horror stories, originally published in the ‘80s and ‘90s and out-of-print for years, along with a stunning new novella written especially for this collection. With a foreword by horror master Chet Williamson and an introduction by the author, this book is an unforgettable journey through the quiet heart of terror. I love a good introduction because it gives you the background of each story. Paul F. Olson does a great job of ordering the stories so you can see a clear progression in the quality and depth of his writing. The author suggests reading them in the order they were printed, and that is how I read them. The collection gets off to a strong start with The Visitor. A yearly visitor comes to town and strange happenings occur. The townsfolk try to persuade him to leave, but it is no use. Great story! From a Dreamless Sleep Awakened is an eerie tale! A Native American burial ground is disturbed in a forgotten cave. The Forever Bird is a “careful what you wish for” tale! This story left me feeling uneasy. Homecoming is about returning home and being overwhelmed with old memories. The man must face his darkest memory that waits outside. They Came From the Suburbs is a fun Dawn of the Dead type of story about old people. The old people come to the mall, but they never buy anything. Crazy story! Through the Storm is the story of a boy at his aunt’s house. Something is down there! Something is in the cellar! Great story! The More Things Change is about the world changing! Awesome story! Guides is a great story! A fishing guide finds out that his family is cursed. Getting Back is about a man who is haunted by a ghost. Great story! Faith and Henry Gustafson is disturbing! A cop gets a phone call from an abandoned camp. The cop has to face his worst fears. Down the Valley Wild is about paying old debts! Bloodybones is an urban legend. Or is he? A man looks for his missing girlfriend, but he comes across his worst nightmare. This story is excellent! 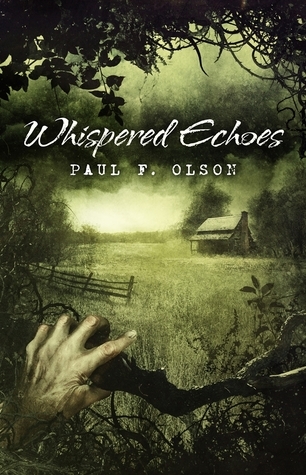 Whispered Echoes is a great collection of short stories! Each story brings something different to the table. No two stories are the same. Each story gets better and better as you read through this collection. This is my first time reading Paul F. Olson, but it won’t be my last. I highly recommend this collection to fans of horror! I found this interview on Amazon. Enjoy! What makes this horror collection so special? Olson: You’ve heard people say “This book was years in the making.” Well, in the case of Whispered Echoes, that’s the literal truth. Actually, it was “decades in the making.” This collection is an overview, a catalog of my career in dark fiction, from the very first short story I ever published in 1983 up to my newest published work. It contains stories from horror fanzines and from major anthologies. Most of them have not been in print or available anywhere but on the collectors’ market for years, and would not have been if not for this book. Why should readers give this collection of Dark Fiction a try? Olson: While the horror stories in Whispered Echoes span a long period of time and incorporate a range of styles, they do have some things in common. First and foremost, I think, is that I’ve always wanted to do just one thing: tell a good story as clearly and entertainingly as possible. And that’s what this collection is about. These short stories may scare you. They might make you anxious, or make you glance over your shoulder, or move you, or make you think. Actually, I hope they do all of those things. But above all, I hope they’ll entertain you. I hope they’ll make you forget where you are for a little while, that they’ll carry you out of your world and into the world of the story, that they’ll make you forget everything but the tale unfolding around you. That’s what happened to me when I was writing them. I take a little trip. And nothing makes me happier than when a reader comes along for the ride. In part because of their style, and in part because some of the stories in the collection are 20 or 30 years old, the book has been called “old school.” That’s fine with me. Old-school horror is the best horror, as far as I’m concerned.